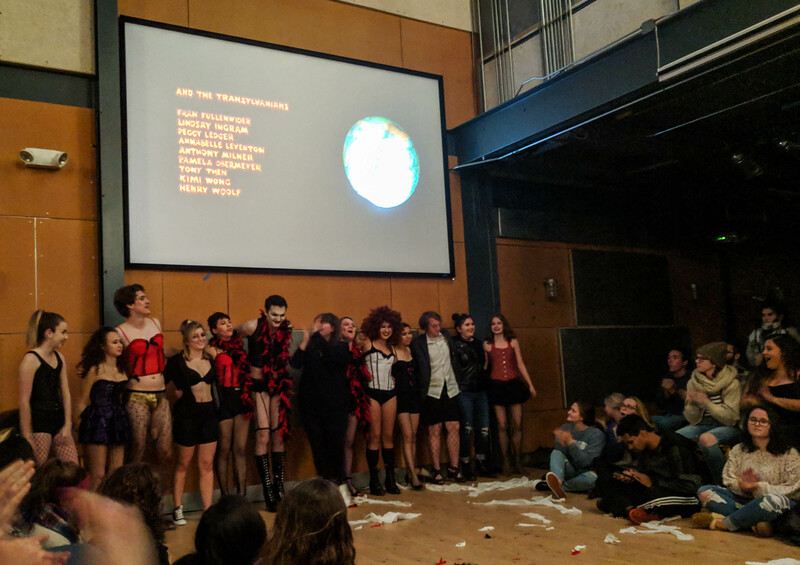 Students Do the Time Warp Again at “Rocky Horror” | The Gettysburgian. On Saturday night, the Attic buzzed in anticipation for the iconic annual rendition of The Rocky Horror Picture Show. Hosted by the Student Musical Theater club, students created a shadow cast, acting out the movie as it played on the wall behind them. Rocky Horror is a musical science fiction horror-comedy from the 1970s, produced as a parody tribute to the science fiction and B-list horror films of the previous decades. Tim Curry, Susan Sarandon, and Barry Bostwick star as a mad scientist and sweethearts Janet and Brad, and seniors Jay Hauser, Abby Wester, and Nikoleta Mountanos played these respective roles in the Gettysburg production. The evening began with the “Virgin Games,” in which cast members Jennifer Clogg ‘21 and Miranda Lieberman ‘19 encouraged audience members to come to the performance space to pop balloons using their hips and to eat bananas as fast as possible. This set the standard for the audience participation throughout the show. Rocky Horror performances are famous for the call-outs that audiences shout like unofficial lines throughout the show. “What other movie can you talk during?” Mountanos joked. While director Julia Burgess ‘20 led the crowd by shouting call-outs of her own, many audience members knew lines that others did not. It is this sense of participation that makes Rocky Horror so unique. With auditions only ten days before the show and only four late-night rehearsals before the actual performance, the production process was a whirlwind, but the cast members banded together to create a great show. The cast included students from all years, but Hauser has played the role of Dr. Frank N. Furter in all four runs of the show that have gone up in his time at Gettysburg. “It’s something to look forward to every year,” he said. The audience cheered when he made his dramatic entrance and subsequently threw off his cape to reveal his outfit of a black corset and boots.